Motown has long given the soul singer short shrift. I hope this Shorty Long biography helps correct that disregard. Frederick Earl Long's May 20, 1940 birth in Birmingham, Alabama was the start of his journey toward R&B greatness. He devoted much of his youth to learning music, both on his own (as in the case of piano) and with pros like W.C. Handy and Alvin Robinson. Long also got his hands on the guitar, drums, organ, harmonica, and trumpet. Shorty Long moved north to--where else?--Detroit in 1959. A few years later, Harvey Fuqua hooked him up with his Tri-Phi label. The singles "I'll Be Here" and "Too Smart" didn't captivate the masses. Long couldn't "Tri" again after Motown bought Fuqua's roster, but he could try again at Berry Gordy's company! Shorty Long's ready smile and easygoing manner made him a natural emcee for the touring Motortown Revues. Still, he preferred to function as a musician, writer, and singer in his own right. Motown hadn't forgotten that. On its latest label, Soul, Long had the honor of co-penning and performing its first release: 1964's lip-smackingly lustful "Devil With the Blue Dress." He also suffered the ignominy of his first flop. Mitch Ryder's successful remake would, at best, vindicate the song's quality. For now, though, it was back to the inkwell. But Shorty still had hope. Long's long-awaited ascension occurred in 1968. A Pigmeat Markham comedy skit and a popular Flip Wilson saying spawned "Here Comes the Judge," which oozed upward to #8. That hit, plus new songs like "Don't Mess With My Weekend," plus old pieces, equaled one new album. The Soul artist also got to produce his own work, a privilege he shared only with Smokey Robinson. With new fans on the outside and support from the inside by Marvin Gaye and others, Long was getting more and more respect. Then, the worst thing that could have happened did. During a Detroit River fishing trip on June 29, 1969, a freighter capsized his boat. Twenty-nine-year-old Shorty Long drowned. 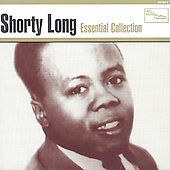 In the wake of his death, Motown issued the album he'd self-produced, The Prime of Shorty Long. No more stinging name would have been possible. Since then, the company has not adequately memorialized him, perhaps because he didn't fit into its pop-soul mold and had barely become a star before he died. We'll never know how high Shorty Long could have risen. At least he enjoyed enough fame in the end to believe the answer, "Very high indeed." You like it like this Shorty Long biography? More Motown oldies bios appear on the homepage.